1 What Makes A Fast Billy Cart Fast? Much of the fun with billy carts is had when they are being designed and built. Creating something from scratch, learning and working together can be a great experience and introduction into automotive/construction. But sometimes it isn’t just about the building, and you want a fast Billy Cart. There are many myths and stories about what makes a fast billy cart, but unfortunately, there is only one way to know. Formula 1 teams have wind tunnels, testing tracks and many internal sensors across the car. Billy cart enthusiasts have a hill and a stopwatch (and maybe a speedo gun) to do their testing with. Testing will let you know what works and what doesn’t and unfortunately, there isn’t any cheating. With this being said, there are a few important items to note that will point you in the right direction when making the most out of your billy cart racer. One question that always surrounds billy carts is ‘do bigger wheels make the cart go faster?’ Bigger wheels do help, but the main problem with wheels is friction and alignment. Friction is the force that stops the wheel from turning. To make sure that your wheels are working effectively, and lessen friction, fix the wheels tight to the axles so they run freely and don’t shake or wobble. Any tyres need to be pumped up and not flat, and you will want to check any spokes to make sure the wheel is running true. Any moving parts should be lubed well so they spin freely. Friction is important, but a billy cart’s wheels must be well aligned and all pointing in the same direction. This will slow your billy cart down so check their direction. Wheels can also become loose which causes wobbling and you down. Making sure wheels are secured against the axles will make the cart run faster by using its energy more efficiently. Sometimes billy cart wheels are replaced with bearings. Bearings can make good wheels, but they must be well lubed to spin well. The second force that you will be fighting as you speed down the hill is drag, so keeping your fast billy cart as aerodynamic as possible makes it faster. An aerodynamic billy cart is smooth and not boxy or square. Smooth curves pass through the air easier which means less drag. All of the good modified carts are streamlined with smooth edges, and are almost never boxy. Aerodynamic billy carts also have a small area to push through the air. In a fast modified cart this can mean that the drivers are lying down as opposed to sitting up. Fast Billy Carts tend to be wider at the front than the back. This is a phenomenon in physics which I can’t explain (not being a physicist), but I am told it has to do with layer separation of the air passing by the cart. ‘Does a heavier cart go faster than a lighter cart?’ The oldest billy cart question and many people believe that with a standard home made billy cart, the heavier the better. A heavier cart has a larger force of gravity which sends it down the hill faster, the heavier cart is going for more momentum and therefore a higher top speed. Not only does it create a larger force of gravity, but a heavier cart with the weight in the correct places can make it easier to control, which can be a point of concern depending on how good your wheels, steering system, and the size of the hill is. But this top speed comes at the cost of acceleration and less friction on the wheels. It is more likely that the longer hill, the better to have a heavier cart, the shorter, better to have a lighter cart. However, the only way to tell in your situation (as there are a few forces at work friction, drag, acceleration, top speed) is testing. The only set rule for wheels, is that they should be as light as possible. This in cars is called unsprung weight, and it means that you lessen friction making the cart move faster. Steering is important to take the shortest (and fastest) route from A to B. Having wonky steering can cause your billy cart to travel all over the road, covering more distance and making the finish line further away than it has to be. This makes steering very important in the pursuit for speed. The timber and rope method typically employed for a traditional billy cart is good for mid to low speeds. If you feel it isn’t enough, you can attempt a king-pin assembly which may need a some metal fabrication experience. For the more enthusiastic billy cart engineers here are some advanced tips. Building a shroud is what takes a billy cart to a serious modified billy cart. They are typically as light as possible and good materials for making them are bending ply and fiberglass. Perspex, plastic or clear fiberglass is used for windshields. Something else to think about is the size of the wheels. Having larger wheels at the back and smaller at the front can cause an effect of the rear wheels trying to catch the front wheels. This can give you the edge over your rivals. Fast modified billy carts are often given space between the ground and the bottom of the billy cart, this prevents down force (drag) and lets the air pass by the cart easier. I hope this helps you get that extra fast Billy Cart speed you wanted. Are There Any Restrictions For Your Billy Cart Designs? If you are building a Billy Cart for a particular race or derby, it is good to know what the construction requirements are for that event. Most of the events held around Billy Carts have some form of construction requirements for the classes that will race at that event. It would be heartbreaking to build a cart only to not be able to race it because it is too long for instance. It would also be frustrating to enter a cart that is much slower than its competitors because it is not built for the particular race. The following points are a guide for Billy Cart designers and builders, which have been taken from a number of events. If you are designing and building a cart not for any particular event, it can be good to look through the list to make sure your cart has the appropriate safety considerations. The first thing you want to know is the safety requirements. As safety is the main reason for many of the Billy Cart construction requirements. Do competitors need to wear a helmet, if so what type? Is there any special protective clothing that needs to be worn, any particular shoes/boots? 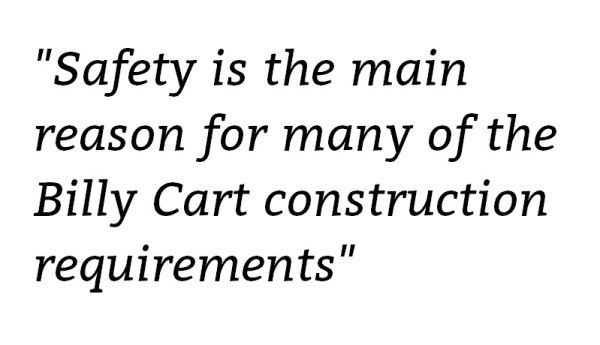 Safety is also a very important design factor in your cart. Do brakes need to be on the cart, what type? What steering is allowed on the cart, will a rope do or is something more serious required? What can and can’t the Billy cart be made of? Are windshields allowed? What is the maximum size, do they need to be hard wheels or can you use bike tyres? Can the wheels be directly attached to the cart, or do they need a steel axle? How wide can the wheels be? How long, wide and high can the cart be? How does the pilot sit on the cart, can they lie down or do they have to sit upright? How many persons are required on the cart? How heavy or light can the cart be, does that include or not include the driver? Is any extra weight allowed? Knowing the race conditions and the track whilst making your Billy Cart designs can help you at race time not only get your cart on the track, but also help make it competitive. Is the cart let go from the top of a hill, from a starting Ramp or can the pilot push like a bobsled race? It’s good to know information like, how long is the race, does the track have any corners, and how steep is the hill if there is any. The best way to know about what passes on race day is to ask the organiser for the construction requirements. Once you have and idea of what you can and can’t build, talk to others who are building a cart to canvas for design ideas. Clues like ‘windscreens are allowed’ written on construction requirements can mean that many of your competitors will not be open, and have covers or shrouds over them. Talking to other builders can help unearth these intricacies. I hope this helps your Billy cart planning efforts.